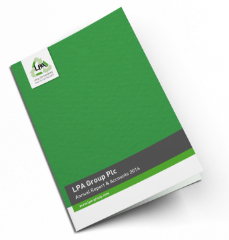 LPA Group Plc is a world leader in the design, build and supply of LED lighting, electrical connectors/connector systems, and high performance electrical components. With its high quality, design for life philosophy, LPA provides cost-effective solutions to improve reliability, reduce maintenance and minimise life cycle costs for the rail, aerospace, defence, aircraft support, infrastructure, marine, and industrial markets throughout the world. Investor Information can be found here.